Colin Kaepernick fumbled at the goal line with two seconds left and the St. Louis Rams escaped San Francisco with a 13-10 upset win over the 49ers on Sunday. Kaepernick kept the ball on a keeper and it appeared as though he had crossed the plane when the ball popped out and fell to the ground. The Rams recovered. The play was reviewed and upheld. Greg Zuerlein kicked a go-ahead 39-yard field goal for the Rams (3-5) with 5:25 left. San Francisco got the ball back with 3:11 remaining on its own the 12. Kaepernick completed long passes to Stevie Johnson and Anquan Boldin in the final drive. 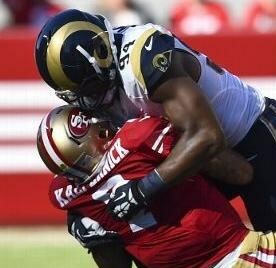 The Rams also sacked Kaepernick eight times, but he threw for 237 yards. The Rams were held to 193 yards of total offense.